It is true that the Earth has been warming, and thankfully so, from the coldest part of the past 10,000 years, the Little Ice Age (1400s-1800s). This warming started in the mid 1800s, and well before CO2 became an issue in the post WWII period. This warming amounts to 0.8 deg C, according to the UN IPCC. Natural forces were the cause of the start of the warming period. We also know that temperatures warmed significantly from 1910-1940, also from natural forces, and that temperatures cooled from the 1940s to the late 1970s to such an extent that some warned of a coming ice period (the 1970s global cooling scare). That's right, temperatures cooled for four straight decades while CO2 levels noticeably increased. The warmest decade in the USA was the 1930s...so what are the natural forces that caused this because it is not possible CO2 did. There is no doubt that temperatures have warmed. The question is, how much of the warming is caused by mankind (and certainly mankind is responsible for some of the warming) and how much is from natural climate variation. The scientific method states that any theory, such as dangerous man made global warming, must be supported by observation. Otherwise it remains a guess. We should also remember the words of Albert Einstein....."that no number of experiments will prove me right......it only takes a single experiment to prove me wrong". 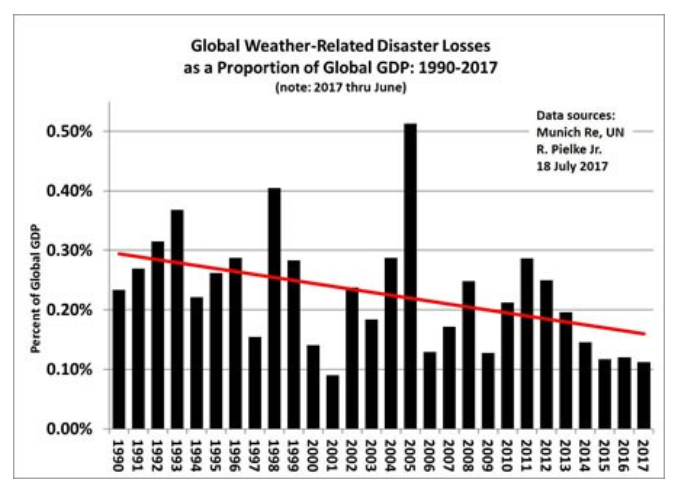 Thus it should not be the responsibility of skeptics to prove the advocates of dangerous man made warming wrong, it should be the responsibility of the 'warmers' to prove their theory is correct. Remember, it only takes one experiment to prove a theory wrong, according to Einstein. Try this one one, CO2 levels were mostly much higher than today in the prior 600 million years, the climate has always been changing, it has never been stable, and CO2 over that entire time has never been seen as a driver of the global climate. Never. So why today one should ask? Some answers to these questions can be investigated by simply looking at the past as well as at current conditions. So what do we know? CO2 levels today are among the lowest in the known history of Earth. That's right, CO2 levels were as much as 17 times greater than today in 85% of the past 600 million years. Obviously high levels of CO2 in the past were not caused by mankind but by natural forces, so what were those forces and how do we know they are not also at work today? In fact, there were three ice periods with more CO2 than today. One had fifteen times more CO2, one five times more. If CO2 was such a powerful greenhouse gas how is this possible? Clearly natural forces are very powerful drivers of the climate, CO2 is a weak warming agent, or both. CO2 levels were also 5 times or more greater in the period of the Dinosaurs than today, a period which experienced incredible biodiversity and an explosion of life. So clearly rising CO2 levels can not cause a major extinction. Another important fact is that rising CO2, by itself, can not cause dangerous warming. Its warming properties are logarithmic, meaning the more there is, the less additional warming it can cause. link For there to be dangerous warming, other things must occur, called positive feedbacks, that would amplify the warming from rising CO2. The most likely positive feedback is an increase in water vapor. Water vapor comprises 95% of the the greenhouse gasses and is a very powerful warming agent. The UN IPCC believes water vapor would comprise at least two thirds of the total warming from rising CO2. As the theory and predictions go....some increased temperatures from rising CO2 should cause more water vapor, which causes even more warming, more water vapor etc and tempertures continue to rise and even to the point of spiriling out of control. But there are problems with this theory. First, observation shows that positive feedbacks have not existed in the past and when CO2 levels were significantly greater than today. 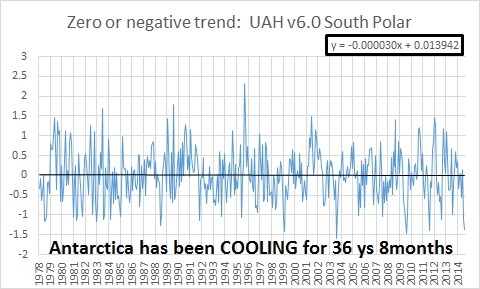 Also, atmospheric humidity is actually in decline in the upper atmosphere, exactly where some predicted CO2 would cause the water vapor to increase. link Absent positive feedbacks CO2 can not possibly cause the dangerous level of warming some predict. The expected warming from CO2, called sensitivity, is constantly be revised 'downward' as temperatures have stubbornly refused to cooperate with climate models that predict rising temperatures from increasing levels of CO2. Rising CO2 is supposed to be causing significant changes in the climate and life on the planet, but is it? Saying the oceans are becoming acidic is similar to saying on a 100 def f day, and temperatures fall to 99 deg f, that the temperature is winterizing. It certainly is not winterizing, it is simply less hot. The oceans are alkaline, which is the opposite of acid. It is possible they will become somewhat less alkaline but they will never become acid. The Pacific Ocean, for example, was significantly warmer than today in most of the prior 10,000 years. It did not become acid then, so how could it possibly do so now? Link Corals evolved in a period when temperatures were ten deg C warmer and CO2 levels ten times higher than today. There are 350,000,000 cubic miles of ocean water. CO2 is a trace gas, it is measured in parts per million. CO2 levels have only increased approximately 1/10,000th as a percentage of the atmosphere in the past century. A 1/10,000th increase in CO2 as a percentage of the atmosphere is not going to turn several hundred million cubic miles of ocean water into acid. The climate alarm is mostly based on models, none of which have accurately predicted what temperatures would do. They are constantly being revised...downward. Natural forces such as solar activity, cloud formation, and ocean cycles are not fully understood nor are they often even considered in many models. The impact from rising CO2 also has been overstated. link The climate has always been changing in the past so clearly there are powerful natural forces at work than just CO2. How is it possible that some evidently believe natural forces, which had considerable impact in the past on the climate no longer are? How is it that CO2, which has never been observed to be a major driver of the climate in the geological record is now in near total control of the climate? Are There Benefits to Rising CO2? I find it interesting that the benefits of rising CO2 are overlooked. According to NASA the Earth is 8% greener than in 1980 and mostly due to CO2 fertilization. link Plants consume CO2 and through photsynthesis to fuel plant growth link Plants evolved in a period when CO2 levels were much higher than today. They also grow more quickly with rising CO2 levels. link This seems to be having a positive impact with record global crop production. Greenhouses routinely increase CO2 levels to 1,000ppm to cause their plants to grow more quickly. Plants also need less water with rising CO2 levels, there is a greening of arid area and also less drought. link CO2 is often called a pollutant. Yet CO2 is essential for life to exist on the planet. If levels were cut in half, life would be at a danger point since with too little CO2 plants stop growing. If this were to happen life on Earth would perish, not from too much CO2, but from too little of it. What If Rising CO2 Was Truly Dangerous? If rising CO2 would cause all the things some say it will, more storms, melting ice caps etc, I would fear that it would be impossible to stop simply because the developing world is rapidly developing and releasing more CO2. 2 billion people do not have access to reliable electricity. Their lives are harsh and brutally short. They want a better living standard but can not achieve it withour access to reliable and cheap energy. There are benefits to energy availability in that it is the developing world where population is growing the fastest. By helping these areas develop the rate of population growth would drop significantly as it has in other more advanced nations. If the CO2 alarm is completely true, adaptation would probably be the only practical solution and until new, inexpensive, universally available totally clean energy is available on a vast scale. This day likely will happen but until it does we must work with what we have. Spending trillions of dollars on a false alarm has few benefits. The same resources could be used to give many millions access to the clean water they need to live healthy, productive lives. If CO2 is not the primary driver of the climate, what is? We know that the climate in the past has always been changing. While there is no observable evidence that CO2 is a major driver of the climate, there is a very close relationship between solar activity, ocean cycles and temperatures. Solar activity as measured by the number and size of sunspots first began with Galileo in the early 1600s. Solar activity also leaves an isotope in the soil. Temperature reconstructions of the past show that solar activity and global temperatures are linked. link The coldest periods are also ones with the lowest solar activity.link Solar activity is not constanct, it is constantly fluctuating. Solar activity is also connected with warming periods, according to the prestigious Max Planck Institute in Germany solar activity in the 1980s was the strongest in the past 8,000 years. link We are in solar cycle 24, which is one of the weakest cycles going back to when observation started by telescope in the 1600s. So what are the connections between changing solar activity and temperature. Solar cycles average about 11 years in length. 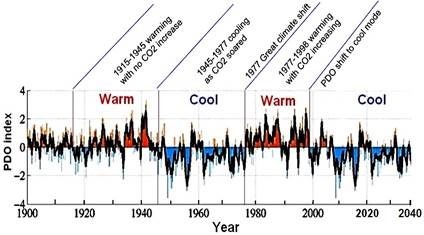 Shorter cycles are associated with warming temperatures, longer cycles with cooling ones. It so happens that in the past 50 years many of the solar cycles have often been very short in length. The Sun warms the sea surface. There is 1,000 times more energy in the ocean than in the atmosphere. There are known ocean cycles such as the PDO (Pacific Decadal Oscillation) link and AMO (Atlantic Multidecadal Oscillation), of cooling and warming. It so happens that the ocen cycles in the the 1980s and early 1990s were in their warm phase. The Pacific has moved out of its warm phase and the Atlantic soon will. We see the immediate impact on global temperatures from short term El Nino Pacific warming events so the oceans have an important influence on them. So what will be the result of the weakest solar activity in almost two centuries combined with the oceans moving into their cold dominated phases lead to? In the past this has always led to cooler global temperatures. We live in a laboratory and we will soon find out.